If you have a Mac Pro and want to take advantage of USB 3.0 speeds, don't fret. HighPoint gives your system USB 3.0 compatibility with the RocketU Quad USB 3.0 for Mac, a PCI Express card with four USB 3.0 ports. The RocketU works with most USB 3.0 drives available and gives a speed boost to USB 2.0 drives. To evaluate the card, we used a Mac Pro with a 2.66GHz quad core Xeon processor, 3GB of RAM, and an internal Hitachi hard drive with 640GB of storage capacity. 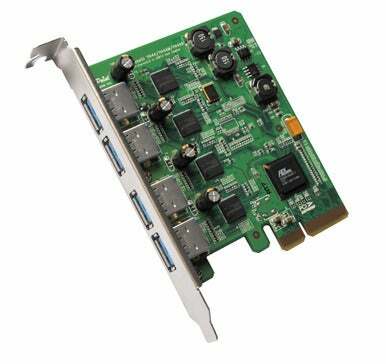 We installed the RocketU into an empty PCI Express x16 slot, but you can also plug it into an x4 slot. After inserting the card into the Mac Pro, powering up the machine, and installing the drivers, the card was ready to go. The best thing about the card is that it functions with all sorts of external hard drive brands. Other USB 3.0 cards we’ve looked at were made to operate with drives from specific companies, severely limiting what you could work with. We tried eight different USB 3.0 drives, ranging from portable and desktop hard drives to solid state drives (SSDs), and all of them mounted and were available for use on our Mac Pro. To check for speed, we tested the drives through the USB 2.0 ports on the Mac Pro for a baseline result, and then performed the same tests using the RocketU. The drives that we tested saw a dramatic boost in performance when switching from USB 2.0 on the Mac Pro to the RocketU’s USB 3.0. The Western Digital My Passport Essential 500GB ( ) wrote a 2GB folder at 29.8MBps and a 2GB file at 30.7MBps through USB 2.0. When attached to a RocketU USB 3.0 port, it wrote the 2GB folder at 59.7MBps and 2GB file at 65.4MBps. We saw an even bigger boost when we tested the LaCie Rikiki 500GB ( ); it recorded speeds of 30.2MBps and 32.9MBps in our 2GB folder and 2GB file write tests, respectively. When connected to the RocketU, the Rikiki posted speeds of 73.1MBps and 84.0MBps in our 2GB folder and 2GB file write tests. Solid state drives really took off when connected to the RocketU, tripling their performance when using USB 2.0. The ioSafe Rugged Portable SSD ( ) gathered scores of 90.4MBps and 106.8MBps in our 2GB folder and 2GB file write tests, respectively. The OCZ Enyo 128GB posted a rate of 110.2MBps in the 2GB folder write test and 107.2MBps in the 2GB file write test. USB 2.0 drives when connected to the RocketU also got a bit of a speed boost, especially when writing files. The RocStor Blazer B9 500GB saw its 2GB folder write speeds increase from 30.4MBps to 37.1MBps. The Avastor HDX-1500 1TB ( ) saw its write speed jump from 32.0MBps to 41.7MBps. Both drives posted rates over 40MBps in the AJA write tests. How does FireWire 800 compare to USB 3.0? To find out, we tested the RocketU with the LaCie d2 Quadra USB 3.0, which has both USB 3.0 and FireWire 800 ports. In our 2GB folder write test, the USB 3.0 rate was 84.2MBps, while the FireWire 800 rate was 71.6MBps. Transferring a 2GB file from the d2 Quadra was much faster via USB 3.0, with a rate of 103.5MBps compared to 82.4MBps connected to FireWire 800. The AJA test revealed an increased speed gap between the connections, showing the d2 Quadra could write data at 70.3MBps when using FireWire 800, but could go as high as 109.5MBps via USB 3.0. The RocketU beat LaCie’s USB 3.0 PCI Express Card in all but one test. The d2 Quadra was faster when connected to the RocketU than to the LaCie card. The drive reached 81.4MBps in the 2GB file test when linked to the LaCie card, then zoomed to 103.5MBps when connected to the RocketU. That’s impressive, considering the LaCie card was designed to work best with LaCie’s USB 3.0 drives. The RocketU also lets you set up a set of external drives as a RAID array. We created a RAID by connecting two drives to the RocketU and firing up Safari—you configure the array through a Web browser on your Mac. After going through the setup, we created a RAID 0 array that worked really well. The main drawback is that a RAID array created this way will work only with the RocketU card; you can’t connect the drives to the USB 2.0 ports on a Mac and still have an array. There’s no real advantage to creating an array with the card, except that you get USB 3.0 speeds and can make RAID 5 and 10 arrays with the card, which you can’t do with OS X’s tools. The RocketU Quad USB 3.0 PCI-E Card works with most USB 3.0 drives (it’s incompatible with Seagate drives with 3TB or higher capacity) and gives your USB 2.0 drives a nice pick up in transfer speeds. Sure, it isn’t Thunderbolt, but considering the availability of USB 3.0 drives on the market, this card would be a great investment for a Mac Pro owner.